Meet beautiful Amelia! This little girl’s smile is contagious! We are thrilled that Amelia is doing so well and that we were able to help her family during one of the most difficult times in their life. Meet our AMAZING kid of the week, Amelia! “My name is Melissa Ann MacNeil Spencer. I am given many titles on a daily basis: friend, foe, wife, Respiratory Therapist, student, sister (twin), teacher, daughter, confidant…only to name a select few. However, these titles come and go more frequently than the seasons do change. There is only one title I have taken on as my own permanent identity with the highest of pride and honor during my delightful stay thus far on this beautiful, green Earth…MOTHER. I am a mother. I am a mother of two amazingly beautiful and happy children. Hayden and Amelia, ages 8 and 4, respectively. It was a title imprinted on my soul on both April 29, 2009 and March 9, 2013 without written or bedside consent. I became an infinitesimally better woman both days I gave birth to such delightful beings. It was a title given free of lessons and free of knowledge of what is to come. A title given to a few select women who are brave enough to carry its beauties and its terrors. It is a title I carry with the greatest of honor. I sacrificed everything I had and was to bring them into this world: my life, my freedom, my own selfish identity, my body; and will sacrifice everything I have and am to keep them in this world as long as I am possibly given the chance. My youngest baby, Amelia, had been fighting symptoms for a few months late last year that confounded many of us and exhausted many sleepless and painful nights in their agony to understand what brings her such screams of agony. We brought her to the clinic multiple times without any form of real diagnosis and one day her pediatrician suggested a head MRI, which my husband and I both thought was inappropriate due to all of her symptoms being mainly gastric up to that point. Yet, we agreed and waited very impatiently for 2 weeks to get the imaging done. Amelia was diagnosed with a very large mass in her brain by MRI on the worst-day-of-my-life October 21, 2016. What started as a G.I. confusion, swiftly became a neurologic condemnation. My family quickly became aware of the terrors unseen horrors can bring in the blink of an eye. My brother-by-marriage, Matt Spencer, given the duty of Reader-of-Amelia’s-Destiny, was the first person to understand the significance of the tragedy that lay ahead for myself; husband, Lucas; sisters, Jen and Christina; grandparents, Pat, Ted, Mark, Penni, Barbara, and Rick; pediatricians Phil Heavner and Anna Gadomski; closest of friends and colleagues; coworkers in both ICU and Respiratory Care; and many other lives Amelia touches on a day-to-day basis and those who saw first-hand our struggle that morning with tears and defeat in our eyes as we wandered through the corridors we walk on a regular basis in search of the embrace of a child too young to understand the miseries to come. It was a tragedy and sadness for anyone who knows this beautiful child. I am all too awe-stricken by the swiftness in which everything was coordinated upon the news of Amelia’s misfortune. 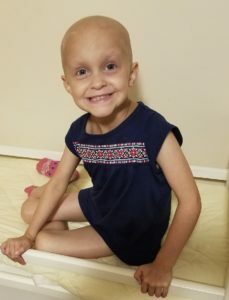 Within the matter of hours we were already on the road to from Cooperstown to Rochester to meet with the Chief of Pediatric Neurosurgery and a Pediatric Oncologist to decide the all-too-necessary events to alleviate the pressure and size of the mass within her head. Surgery was already scheduled for the following week before we were even packed, and could be squeezed in quicker if her symptoms decide otherwise. Amelia has since had 2 surgeries, 3 rounds of induction chemotherapy, 6 weeks of radiation, and 3 rounds of consolidation chemotherapy. Her MRI’s have all been clear since the 2nd surgery, without a hint of metastases, and we return to Rochester next week for all of her completion of treatment testing and MRI, so we are hoping for the continued disappearance of any abnormal cells and for remission to be a permanent condition. She started preschool this past week and is a thriving, active, and happy little girl. Her resilience through everything she has been through is inspiring to all who are lucky enough to know her. It is times of such agony that I am reminded of the beauties I am surrounded by every day. On that horrific morning of diagnosis, I was and am so grateful for the MRI staff, the Gods of Anesthesia that kept my baby safe -sedated and intubated- during her scan, the family of nurses who walked by and smiled at her as she unknowingly awaited her moment of fate, the Respiratory Care family that texted me at 5 am as I made my coffee unknowingly headed toward my day from hell, the highly-esteemed physician who stopped and gave hugs, knowing that was all he could do seeing the looks of despair in our eyes as he met us unknowingly in the hallway. The kind acts done through this entire nightmarish process, from caring for my best friend Donkey (our faithful pup) to sending care packages for the kids’ car rides back and forth to Rochester, to the mass quantities of texts, emails and calls since then that have been overwhelming and beautiful in their search for help and sympathy in a time so ugly by anyone touched by its tragedy and to monetary help in a time when working was near impossible.